On the first screen in the Trumba Startup Wizard, you accepted (or modified) the organization name you used when you registered for your trial. The wizard uses your organization name in creating the calendar name. You can change a calendar's name and adjust other calendar-related settings in the Trumba editing environment. If you've already closed your browser, you can always re-open the editing environment for your new calendar by logging into Trumba.com with the email address and password you used when you registered. Your default calendar is listed under Current Publication on the left, and appears in List format on the right. At the top of the page, click the blue Settings button. Or, click the small arrow to the right of calendar's name, and then click Calendar settings in the drop-down menu. On the Calendar Settings page, replace the current name in the Calendar name field with a more appropriate one. Under Display Options, for Time zone, select your own time zone. At the bottom of the page, click OK. When you completed the Trumba Startup Wizard, you accepted (or modified) the web name the wizard suggested for you. You can change it now, as appropriate. The web name must be unique. It's an essential parameter in URLs that link your site visitors to specific calendar views, and in URLs for custom RSS feeds of calendar events. For more information, go to What a web name is, isn't, and why it matters. You can change a calendar's web name by following these steps. On the Publishing Control Panel page, click the Publish Settings tab, and then click the Edit Publish Settings button. On the Edit Settings page, in the Publish Settings section, replace the current value in the Unique web name field with a more appropriate one. Click Check availability to make sure your selection is unique. On the second screen in the Trumba Startup Wizard, you chose a calendar type. All calendar types come with the following standard data fields on the default event template: Title, Location, Date/Time, Description, and Web Link, so you'll also have these fields on your default event template, regardless of which type you chose. Each calendar type also comes with a set of the most appropriate custom fields for that type. For the Get Started articles, we chose the General Events calendar type, which comes with the custom fields: Audience, Event Image, Event Type, and Featured Event. Your default event template may have different custom fields, but you can still leverage the steps below. Note: An event template is a collection of fields used to create new events. By adding custom fields (and values) to the event template, you can create the filters your site visitors need. 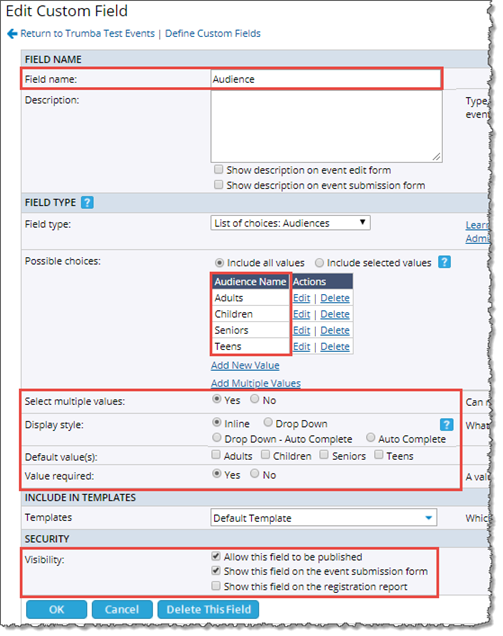 The default fields Event Type and Audience, for example, can provide a view limited to only those events that match one or more selected types, and that are intended for one or more audiences (e.g. Teens and Adults). Updates and additions to custom fields are saved to the default event template associated with your calendar. Open the Trumba editing environment for your new calendar. Under Other Tasks, click Define custom fields. To demonstrate how to edit the default values for the custom fields generated by the wizard, we'll look specifically at Audience and Event Type. Note: The default event template for the Default Template calendar also comes with two other custom fields: Event image, which lets you include images and photos with events; and Featured Event, which lets you promote selected events, such as on the event slider that we reviewed in Get Started 1 on the default hosted calendar. You can save your changes now, or you can always change them later. On the Edit Custom Field page, review and/or update the default values generated by the wizard, as appropriate for your organization. On the Edit Custom Field page, you can change the name of the field; add, or delete values; set the fields to single- or multi-select; change the default value; set the fields to be required (or not); and more. For more information about these settings, see Step 4. Pause your cursor over Add Custom Field at the top of the template. In the pop-up box, click Create New Field. On the Create a New Custom Field page, enter the new name (e.g., "Neighborhood"), and add a description if you want. Descriptions can help if more than one person will be adding events to your calendars and you want to provide guidance. Click Field Type to open the drop-down menu, and then review the available options. To create a list of multiple choices, for example, select List of choices: [create a new list]. When you select a field type with multiple choices, the Possible choices section appears beneath it. To add multiple values, click Add Multiple Values, type the new values separated by commas, and then click Save Values. For our "Neighborhood" example, we added: Downtown, Capitol Hill, Colombia City, West Seattle, Ballard, and University District. You can also configure whether to allow selecting multiple values, the display style, and the default values, if any. Tip If most of your events used certain values, setting a default value can save you time when entering large numbers of events. Determine whether the field should be required, or not. If you select Value required = Yes, an warning message appears when an event submitter tries to create an event without setting a value for the new field. 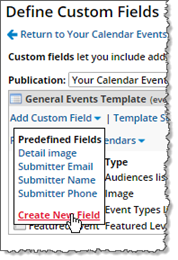 Allow this field to be published means that the custom field will appear in events on your published website calendar. Tip The ability to prevent fields from appearing on published calendars allows you to use custom fields internally. For example, if more than one person creates events, you might create an unpublished field for private notes. Show this field on the event submission form means that, if the public event submission form is enabled on your account, this field will also appear on that form. Click OK, and then at the bottom of the Define Custom Fields page, click Done. Back in the Trumba editing environment, at the top of the calendar, click Add Event. Notice how the custom fields you've been working with appear in the Add an Event form. If you've created the new Neighborhood custom field, you'll need to add an event to your calendar with the Neighborhood field set in order to see it added to the filter on your hosted calendar. You'll also need to add the new field (plus reflect other changes to your custom fields) in the Filter spud. 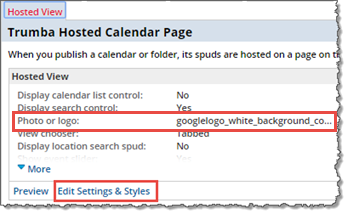 For more information, go to Review the spuds that drive your hosted calendar. Note Fields/values appear on the calendar only if they exist on an event. Review the impact of your changes on the sample events and default filters in your hosted calendar. The sample events that came with your calendar are flagged, as a set, with all of the default custom fields and values. If you delete a value before clearing out the impacted events, those events lose that value. In this section, you'll learn how to manually add new events to your calendar, including populating any data fields that you may have modified or added in the section above. Note If you decide to subscribe to Trumba Connect, and you currently store your event information in another calendar program or database, you don't have to re-enter the information manually into Trumba. You can import event information in a number of common file formats. For more information, go to Import Events. 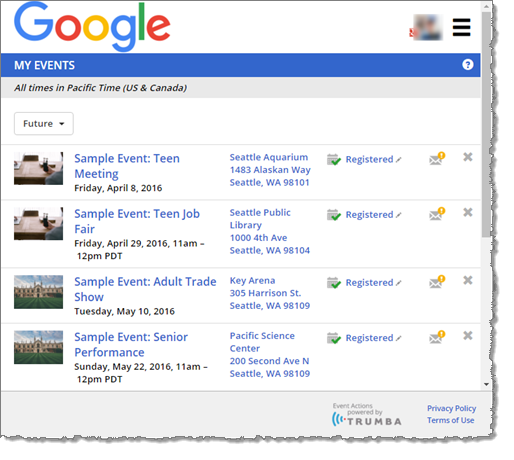 In the Trumba editing environment, go the Month view (link is in the upper-left portion of the page), and then navigate to the date of the event. Click the +Add link at the top right of the date to add the event to that date. Complete populating all of the fields, as appropriate, on the Add an Event page. You can also click the Add Event button at the top of the editing environment at any time, and then submit your own date. Click Save and Add Another to add more events, as needed. Optionally, you can try adding an image to one or more of the events you just created. In the Add an Event form, to the right of the Event image field, click New. In the Add an Image window, click Browse to find an image on your computer. Under Image Properties, in the Display name field, type a friendly display name that describes and identifies the image. The image display name and size appear in the Event image field. Click OK, and then back in the Trumba editing environment, review the events you just created. On the third screen in the Trumba Startup Wizard, you either scanned a website to apply its colors and styles, or you skipped this feature. Go to your live, hosted calendar to see how the colors and styles you selected look in action. For more information, go to Get Started 1: Review your live calendar and Trumba editing environment. 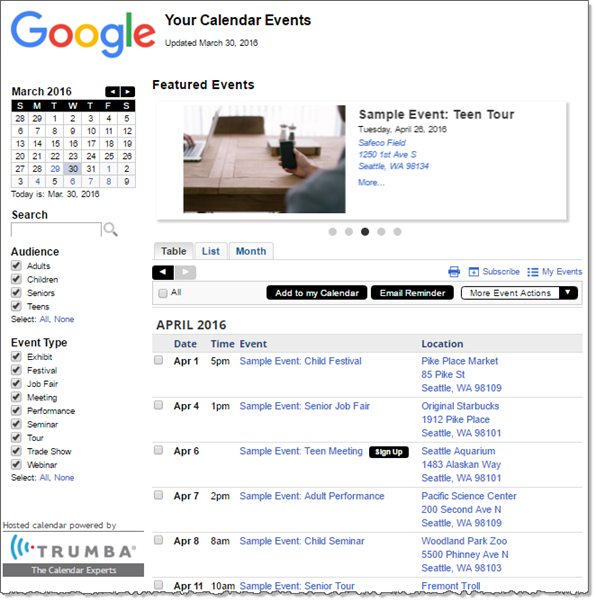 Update the colors and styles generated by the Trumba Startup Wizard for your hosted calendar. 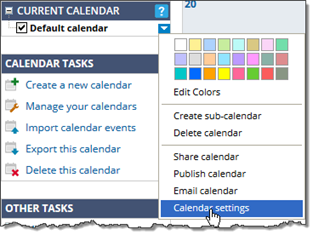 This section walks you through how to change the default color and style settings on your hosted calendar, using the Trumba editing environment. Go to the Trumba Connect home page, click Sign in, and then enter your Trumba credentials to open the Trumba editing environment. On the Edit Settings for Hosted View page, change the logo to the image you want in the Photo or logo field, and then click OK.
Open the Publishing Control Panel again, and then click the Publish Settings tab. Click the Edit Styles & Icons button. To change the font, in the Font Scheme section at the top, update the selected font(s). For more information, go to Use custom fonts. To change the button and link colors, in the Base Page Styles section, update your choices for the Base button background color ("Button Colors" in the wizard), and Base link color ("Link Colors" in the wizard). For more information, go to Why and how to set global styles. Update the colors and styles for the Event Actions web app. The colors and styles the Trumba Startup Wizard generated for your hosted calendar also apply to the Event Actions web app. 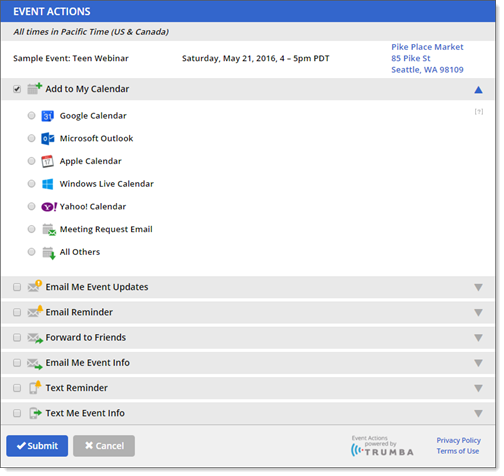 Note Visitors to your calendar can take actions on events through using the Event Actions web app, including adding events to their personal calendars or setting up event reminders. For more information, go to Get Started 5: Event and calendar actions. 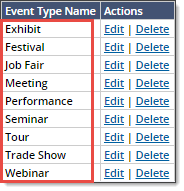 You can display the Event Actions web app (shown below with the defaults from our Get Started example calendar) by going to My Events, or by taking an action on an event. Open your live, hosted calendar, and then click My Events in the upper-right corner. Open your live, hosted calendar, and then select an event (by clicking the checkbox to the left of the date). You can add the event by selecting your personal calendar type in the Add to My Calendar section, and then clicking Submit. In the Trumba editing environment, under Other Tasks on the left, click Customize Event Actions. On the Edit Settings for Event Actions page, on the Settings tab, update the logo in the Banner image field. Title bar color (Background setting, under the Title Bar Colors section). The title bar color matches the active button color set in the wizard. 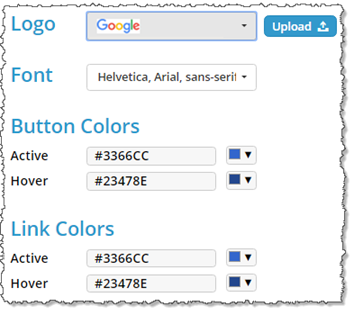 Link colors (Link color settings, under the Link Styles section). The link colors match the active and hover link colors set in the wizard. Navigate button colors (Navigate button settings, under the Button Colors section). The navigate button colors match the active and hover link colors set in the wizard. Commit button colors (Commit button settings, under the Button Colors section). The commit button colors match the active and hover button colors set in the wizard. Click the Preview button at the bottom to review your changes, and then after you're all set, click OK.
For more information, go to Customize the Event Action Web App.